This is one of the most popular buildings for foreingers in the city and when you arrive you see why. The views from the apartment are some of the best in the area as it is by far the tallest building in the nightlife area. 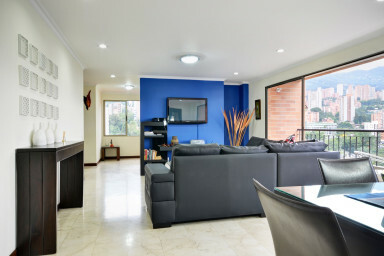 This new and modern apartment is centrally located in El Poblado and has beautiful finishes including hardwood flooring in all three bedrooms, marble flooring in the spacious living-dining area, and a newly installed large capacity water heater for those long hot showers that Americans love. The apartment is within walking distance to almost everything you'll want to do while you're here and for the other locations, taxi's are easy to call and are metered so you don't have to worry about overpaying. The metro station is a 20 minute walk down the hill.